This is one of those plants, like for example the Autumn Crocus, Colchicum autumnale, that produce flowers before their leaves appear. When eventually they do appear the leaves are dark green and very thin and strap-like. 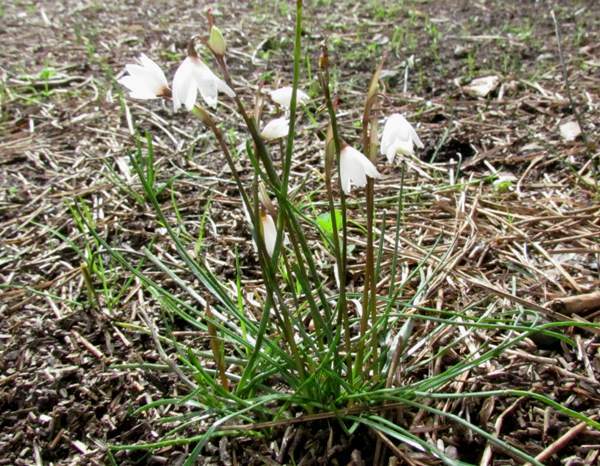 Look out for these lovely wildflowers, which are white and sometimes tinged with pink, in open grassy meadows and rocky or stony ground. Unlike the Autumn Crocus that flowers at the same time, these plants do not require as much moisture and tolerate quite dry conditions. Autumn Snowflake flowers from September until the end of November, their growth having been stimulated by the cooler temperatures that arrive later in the year along with the first, and most welcome, rainfalls. This specimen was photographed in the Algarve in Portugal in November. We found them in the Parque Natural da Ria Formosa which is home to many other lovely plants, birds and animals.